Availability: CURRENTLY UNAVAILABLE. SOLD OUT. SOLD OUT! REGULAR AND LEATHERBOUND EDITIONS ARE STILL AVAILABLE. 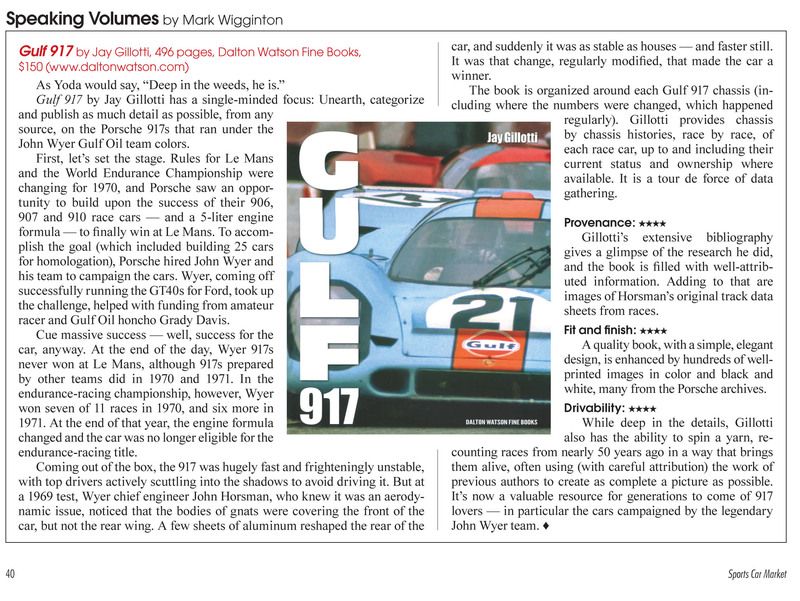 Gulf 917 author, Jay Gillotti. The Porsche 917 is one of the most successful and iconic racing cars of all time, thanks in part to its starring role in the Steve McQueen film, Le Mans. This volume presents a detailed chassis-by-chassis and race-by-race history of the Porsche 917s raced by the John Wyer/Gulf team. 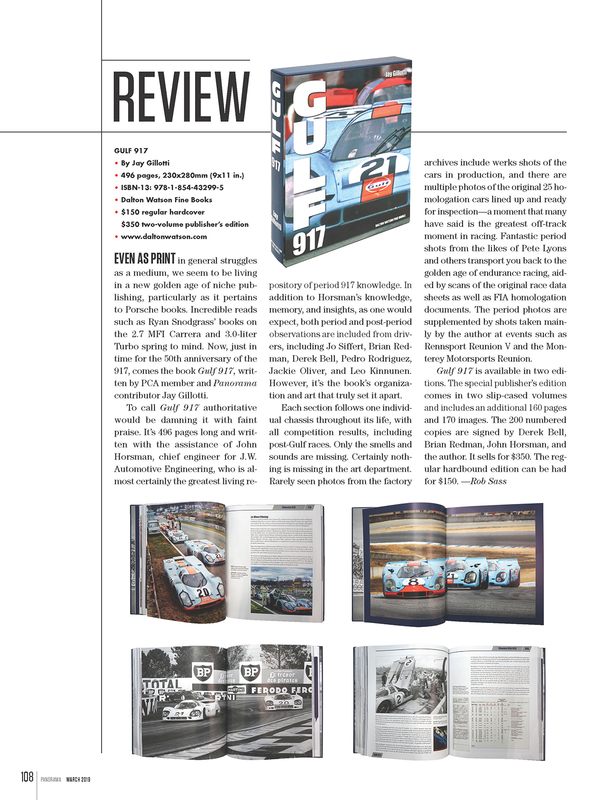 The book includes the history leading to the 917 and the partnership between Porsche, Gulf and JW Automotive Engineering. The cars profiled in the book were instrumental in Porsche’s taking of the 1970 and 1971 World Sportscar Championship titles as the Gulf-Porsche 917s won 11 of the 17 championship races entered. Written with assistance from JWAE Chief Engineer, John Horsman, the book includes scans of his original race data sheets. The book also includes numerous rarely seen photos, many from Porsche’s archive. Detailed post-Gulf histories are presented for each car. Relive the exploits of driving legends Jo Siffert, Pedro Rodriguez and teammates Brian Redman, Leo Kinnunen, Derek Bell and Jackie Oliver as they race the Gulf 917s on the fast tracks of an evocative motorsport era. Follow us on Facebook for photos, excerpts and information about the release of this title! "Like" The Gulf 917 Facebook Page! This book is about the most iconic and one of the most successful Porsches ever! 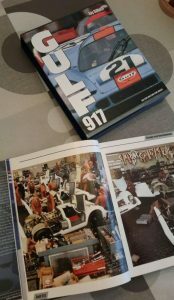 Many books have already been published about the Porsche 917 yet we dare say that this book is a nice addition to the library of every 917 fanatic! Gulf and Porsche entered into a partnership for the 1970 and 1971 season to contest the World Championship Sports Cars Championship. In total, fourteen chassis were deployed by Gulf. In total, Gulf won no less than 11 victories in the 17 races that they participated. For this purpose, drivers such as Jo Siffert, Pedro Rodriguez, Brian Redman, Leo Kinnunen, Derek Bell, and Jackie Oliver were called upon. The book contains many anecdotes and facts. For example, the remuneration of the drivers was paid by Gulf and by Porsche. They each took a team on their behalf. In this book the 14 chassis are examined one by one and described in detail with the history of the cars before and after their Gulf career! The book came about with the cooperation of JWAE Chief Engineer John Horsman. This book is a "must have" for all Porsche fans and in particular for the 917 fanatics !!! There are two versions, the numbered version on 200 copies signed by D. Bell and Brian Redman. Supplemented by an extra second part and the regular version. 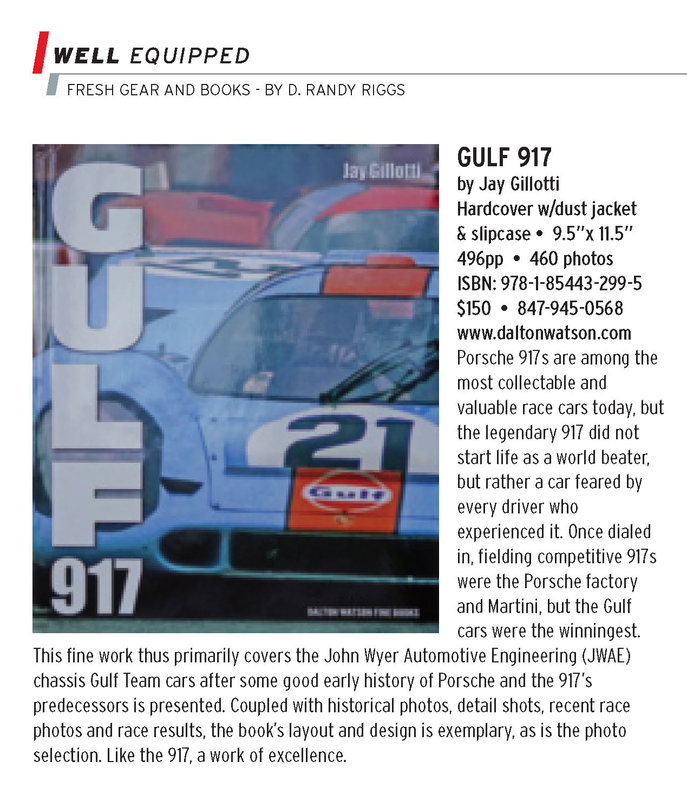 "A must-have for any fans of the Gulf racing program, the Porsche 917 or ’70s endurance racing." Jay Gillotti, Originally from Danbury, Connecticut, Jay has lived in the Seattle area for the past twenty years. He began studying motor sport history in high school and worked for his father in a VW-Audi dealership. He has been a fan of Porsche and the 917 ever since seeing Steve McQueen’s film Le Mans as a youngster. After graduating from the University of Connecticut, Jay spent nearly 30 years in the corporate relocation industry before retiring at the end of 2016. He’s a musician and songwriter with self-produced albums available at CDBaby.com/jaygillotti. Jay was a contributor to motorsport-related books by Michael Keyser (A French Kiss with Death), Christopher Hilton (1982), Brian Redman (Daring Drivers, Deadly Tracks) and Ryan Snodgrass (Turbo 3.0). He is a Porsche Club of America member and contributor to the PCA magazine, Panorama. He has moderated presentations by Brian Redman, John Horsman and Vic Elford for the Porsche Club. Gulf 917 is the result of three decades and more spent researching and gathering information on the Porsche 917, the golden age of sports car racing and the work of JW Automotive Engineering. Jay and his wife, Debbi, live near the shores of Lake Washington and enjoy looking after three adorable Siamese-Balinese cats. .